Is the Gateway the right way to the moon? This article originally appeared in the Dec. 17, 2018 issue of SpaceNews magazine. Sometime in 2028, competing for attention alongside a presidential election and the return of the Summer Olympics to Los Angeles, NASA will return humans to the surface of the moon. A lunar lander will depart the cluster of modules in an elliptical orbit around the moon, called Gateway, and descend. One stage will take the lander to a low lunar orbit and then separate, after which the descent module will handle the rest of the journey to the lunar surface. A crew of up to four will spend days — perhaps up to two weeks — on the surface before boarding the ascent module, which will take them back to the Gateway. At least that’s NASA’s plan for now. A year after President Donald Trump formally directed NASA to return humans to the moon in Space Policy Directive (SPD) 1, the agency has developed the outlines of a plan to carry that out, while emphasizing the language in the policy to do so in a “sustainable” manner and with international and commercial partners. 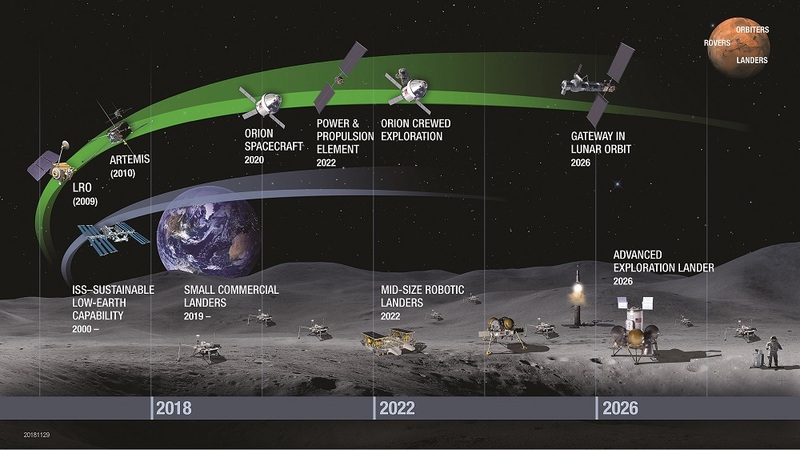 But as the agency describes two of the biggest elements of the plan, the Gateway and a “human-class” lunar lander, it’s still struggling to sell the proposal to its various stakeholders, including its own advisers. But while the Gateway could be repurposed to support human exploration of the moon, NASA lacked a means of getting to the surface. Internally, the agency started to study concepts for lunar lander designs, and put into motion efforts to solicit proposals from industry to study how to get astronauts from the Gateway to the surface. There’s been no shortage of ideas. For example, Lockheed Martin unveiled in October its concept for a large lunar lander, based on designs it had developed earlier for Mars. Its lunar lander was a single-stage vehicle, capable of getting from the Gateway to the moon and back without discarding stages. The company envisioned a propellant depot in the same orbit as the Gateway — eventually using water obtained from lunar ice deposits converted into liquid hydrogen and oxygen — to refuel the lander. The Lockheed concept was big: 62 metric tons when fully fueled, and 22 tons when empty. The vehicle would be 14 meters tall, requiring astronauts in the habitat module at the top of the lander to use what the company called a “simple platform elevator” to get down to the surface. NASA, though, is moving in a different direction. Even in a best-case scenario, a single-stage lunar lander would weigh about 50 metric tons fully fueled, noted Jason Crusan, director of NASA’s Advanced Exploration Systems division, in a presentation Dec. 7 to the human exploration and operations committee of the NASA Advisory Council (NAC). 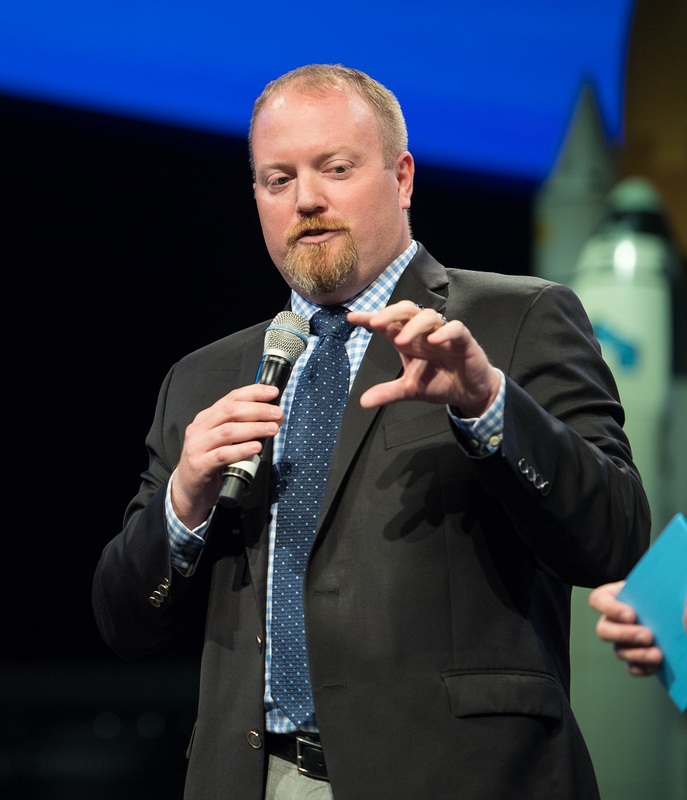 “If you did a single-stage lander, there isn’t a launch vehicle that it can fit on,” he said. Even the future Block 1B version of Space Launch System, he said, can place only about 45 metric tons onto a trajectory to the moon. A two-stage approach, consisting of a descent module and ascent module, would still require the descent module to weight between 32 and 38 metric tons. That could fit on a SLS, Crusan noted, but no other vehicles that exist now or which NASA expects to be available in the near future. However, the ascent module, weighing in at 9 to 12 tons, could fit on a number of commercially available vehicles. What NASA now considers the best option for a lunar lander is a three-stage approach, which adds a transfer vehicle in addition to the ascent and descent modules. “By going to this three-stage architecture, it opens up a lot more of that trade space,” Crusan said. That means more flexibility in how each stage, now small enough to fit on commercial vehicles or be co-manifested on SLS/Orion missions, gets to the moon. However they get there, the three stages would be integrated at the Gateway, with the astronauts boarding the lander there. The transfer vehicle would take the lander from the Gateway’s near-rectilinear halo orbit, an elliptical orbit that goes between about 1,000 and 70,000 kilometers above the moon, to a circular low orbit perhaps 100 kilometers high. The ascent and descent stages would then go down to the lunar surface, and at the end of the mission the ascent stage would fire its engines to go back directly the Gateway. That approach would allow both the ascent stage and the transfer vehicle to be reusable, another selling point for the overall architecture. The descent stage would be left behind on the moon, so a new one would be needed for each mission. But Bill Gerstenmaier, NASA’s associate administrator for human exploration and operations, suggested that the ascent module’s engines could also be used for landing. “All you’re using for the descent vehicle is propellant tanks,” he said at a meeting of the full NASA Advisory Council Dec. 10. Crusan said that an effort to solicit industry studies of lunar lander concepts, once planned for the summer but put on hold as the agency refined its thinking about lunar landers, could be restarted by the end of the year. “We want to get industry studies underway as soon as possible,” he said. At that human exploration and operations committee meeting, some members wondered why the lunar lander, even the three-stage concept currently preferred by NASA, required use of the Gateway. Couldn’t the lander elements dock on their own and then rendezvous with an Orion spacecraft without the need of the Gateway, one person asked. The committee, though, isn’t the only group raising questions about the Gateway or NASA’s overall lunar plans. At a meeting of the National Space Council’s Users’ Advisory Group (UAG) Nov. 15 at NASA Headquarters, Tom Cremins, associate administrator for strategy and plans, gave an overview of what NASA planned to accomplish by 2028 under its overall exploration architecture, a bulleted list that included landing humans on the moon. Later that day, Mike Griffin, the former NASA administrator, spoke to the UAG. While he was there in his current capacity as undersecretary of defense for research and engineering, committee members couldn’t resist asking him for his thoughts about NASA’s plans, knowing his reputation for speaking his mind. But, asked later if the Gateway was the right plan for NASA to pursue, Stallmer and other UAG members on the panel punted. “That’s not for us to decide,” he said. Even proponents of the Gateway have struggled to come up with selling points for it. 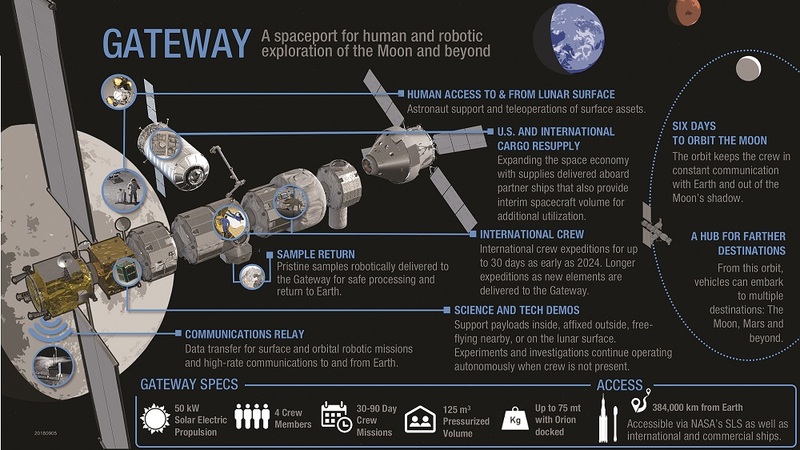 During the NAC human exploration and operations committee meeting, members who said they liked the Gateway struggled to come up with rationales for it that could be easily understood outside the agency. When the full NASA Advisory Committee met at NASA Headquarters Dec. 10, agency leadership went on the offensive to build support for the Gateway, emphasizing sustainability over schedule. Gerstenmaier showed a chart later in the meeting comparing the Gateway approach to the “Apollo-style” alternative for going directly to the moon. The latter approach, he argued, lacks reusability and doesn’t build infrastructure that can make such exploration more sustainable. It also limited opportunities for international and commercial partnerships. As that council meeting progressed, members suggested potential additional studies for the Gateway concept, perhaps in cooperation with the National Academies or the National Space Council’s UAG. “Would it make sense to perhaps convene a workshop — maybe it’s the National Academies or someone else — fairly soon where people put up or shut up in terms of coherent alternative plans?” asked Alan Epstein, representing the National Academies’ Aeronautics and Space Engineering Board.